Most of the people in Rawa Badak are poor. It has a serious problem with clean water and rubbish, and there is often flooding. But Kelapa Gading is next to Rawa Badak with Beverly Hills-style houses for the few rich people and they have a much more reliable water supply. The lack of service in areas like Rawa Badak meant that the city’s poorest people often had to pay private traders for drinking water. They paid about 43 cents for filling a 4.5 litre capacity can. This is very expensive compared to the 35 cents for 1,000 litres for tap water. When the PDAM water supply wasn’t working, the private traders doubled their prices. Working with SP Nur began to organize in the community to ask for change. But then she was shocked to find that a private company managed the water and not the state. Jakarta’s water privatization story began in June 1991. Then the World Bank agreed to lend PAM Jaya, the city’s public water utility, $92 million for infrastructure improvements. But it also wanted privatization. Suharto, Indonesia’s most corrupt and dictatorial president, ordered the privatization in 1995. 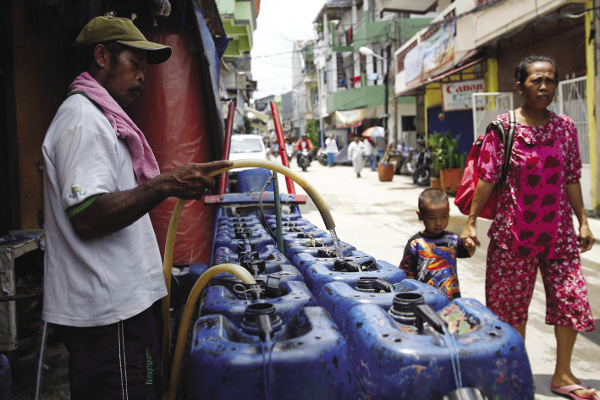 In 1997 Jakarta’s water utilities was shared between two operations. One half was with the UK’s Thames Water and a company owned by his eldest son. The other half was with the big French company, Suez and a company owned by one of Suharto’s family. A deal guaranteed profit to the private companies and allowed them to raise their prices for water. But the government was not allowed to raise prices at the same rate. Water prices for Jakarta residents went up really high, much more than in other big cities like Surabaya, where water provision stayed in public hands. In this way public losses grew and the private companies did not invest in the infrastructure. Nur saw all of this when SP joined other civil society groups as the Coalition of Jakarta Residents Opposing Water Privatization (KMMSAJ). They went to court in November 2012 to end privatization and return water to public provision. The global trade union federation Public Services International also got involved and provided experts to speak in court. In 2015, they won at the Central Jakarta District Court. But a year later the private companies and the president, finance minister, and public works and public housing minister, made an appeal and won. In the end the case went to the Supreme Court, which stopped the contract agreements with the two private water companies and ordered the provincial and central governments to end water privatization. The court made their decision in April 2017, but only made the decision public in October 2017. In that time both companies sold their shares. This raises questions for the future – why would anyone buy a company that lost the battle? Bambang Widjojanto is a human rights activist and lawyer. He says the coalition now needs to make the government start a task force to make sure water goes to public ownership. They will also need to do a lot of work to protect the jobs of water supply workers when the change happens. At the time of writing - May 2018 – even after the court’s decision, the private contracts are still in force. The fear is that they could stay force until 2023, when they end, and increase public debt. But if the government takes action, there is the risk that the private companies will sue the government for millions of dollars. It looks like a very difficult battle and activists are getting ready for it and with international support. This page was last edited on 24 May 2018, at 13:15.